What Makes Our Commercial Boilers Special? What makes Viessmann’s commercial boilers special? Our range of boilers have been specifically designed to provide convenient heat generation for a range of commercial uses. Utilising cutting-edge technologies which we have developed throughout our 100 year history, we have tailor-made boiler system solutions for all kinds of commercial application. Whether you are looking to install a new boiler in newly built premises or you are looking to install a new boiler as part of a modernisation project, we have the solution. Across our commercial boiler range, we offer a number of fuel options including gas and oil, plus renewable technologies such as biomass, solar thermal systems and air source and ground source heat pumps. It is the innovative technology which are boilers are equipped with, which makes them so special though. We have designed all of our gas boilers to meet the requirements demanded by efficient condensing technology. With 98 percent or more of the energy used within our gas boilers, converted to heat, by choosing one of our commercial condensing boilers you will be making a positive contribution to protecting the climate and the environment. Equipping them for the future, all of the commercial heating systems we offer are compatible with a range of fuel sources. This means you will be able to reduce your business overheads by utilising a solar thermal system to provide hot water backup, whilst also reducing the carbon footprint of your business.Whilst the combustion controller featured within our gas condensing boiler range is designed to automatically adjust to various gas types, including biogas mixtures, meaning these heating systems are equipped to be used with sustainable fuels. Our range of Viessmann commercial heating systems also comprises of dedicated systems powered by fully renewable technologies. These heating systems include solar thermal systems to heat domestic water and provide central heating backup, plus biomass boiler options which utilise logs, woodchips and pellets to generate heat. We also offer a number of hybrid devices, including heat pumps which exploit heat from the ground, the groundwater and the ambient air. Innovative technology such as the gas adsorption heating appliance used within our gas condensing boilers, reduces gas consumption by a further 25 percent compared to conventional condensing technology. This enables you to save fuel, reduce your overheads and cut your emissions further. 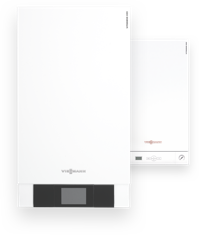 A simple but incredibly effective Viessmann technology is Weather Compensation, available with our Vitodens range of condensing boilers. Consisting of a simple outdoor sensor and Weather Compensation controls, our Weather Compensation technology harnesses the natural signals provided by the elements to adjust the temperature inside your home based on the temperature outside. Utilising this technology can assist you in saving up to 15% more fuel each year, whilst also ensuring a pleasant indoor temperature, whatever the weather. At Viessmann, we love to lead from the front - from the commercial boilers we manufacture to the sports people we sponsor. We are proud to participate in ‘Heat for Good', an open membership charity install programme of industry suppliers and installers. Our steam boilers offer energy efficient and clean provision of steam in conjunction with high levels of operational safety and system reliability. Our range of reliable and environmentally responsible biomass boilers offers versatile and flexible supply system options for almost any application. Our cutting-edge range of hot water boiler systems are designed for energy efficient and clean provision of heat in a wide range of applications.